Table Saw skills are among the most fundamental and important in maximizing your time and success in your wood shop. 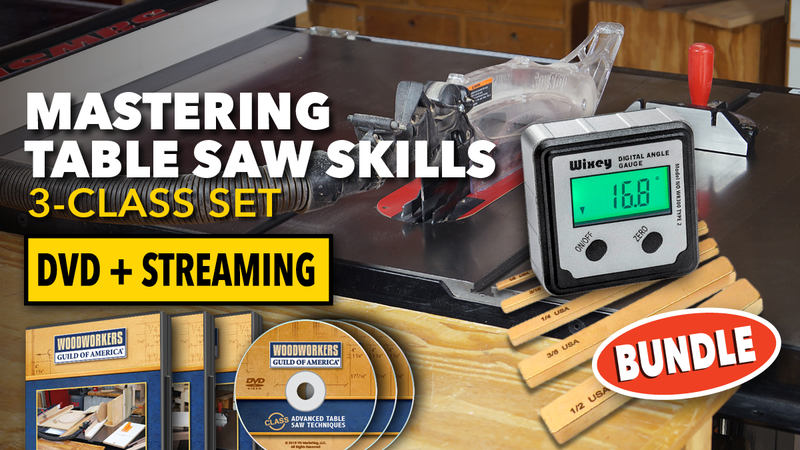 With this set of 3 classes, you’ll get in-depth instruction and new ideas related to a variety of table saw skills and capabilities. You’ll come away from this multi-class program with new ability to create more projects with more creativity and efficiency. These classes will provide you with invaluable training and will help you get more out of your table saw, your time, and your skills! To maximize your convenience and long-term viewing flexibility, you’ll own these classes in TWO forms – on DVD and via streaming video online. With this 2-media access, you can enjoy or share the instruction no matter where you’re at! Each of the three classes you’ll receive includes bonus printable PDF resources that will supplement and expand upon the video instruction you’ll see. This bundle includes over 4 hours of video instruction with the DVD titles and topics below. 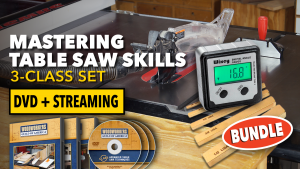 In addition, you’ll get a digital angle gauge and a set of brass set-up gauges – all are fantastic items for using with your table saw and with many other shop tools. These two items alone have a value of $42 when sold separately. 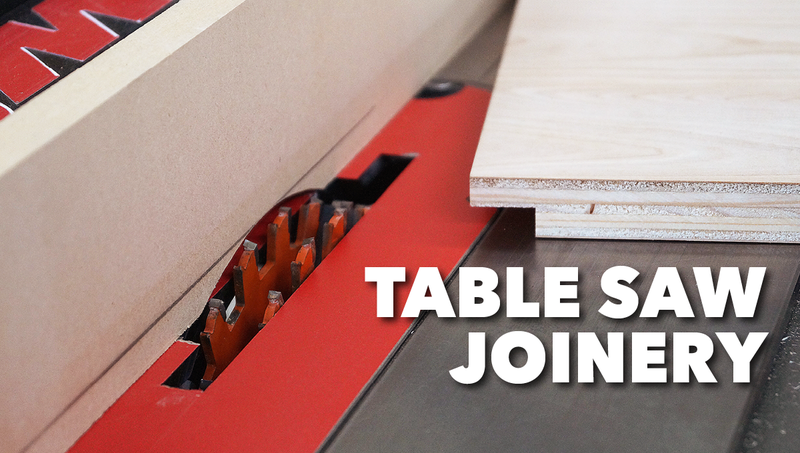 It’s hard to imagine a woodworking shop that doesn’t include a table saw. 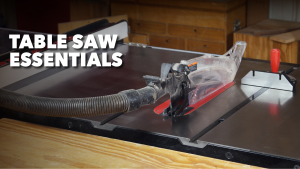 Whether you’re rough cutting stock to size, taking it to its final dimensions, or doing the joinery required for your woodworking project, a table saw has you covered. In addition to showing you every detail required to master these joints, we’ll show you multiple approaches to making individual joints. This provides you with a handful of techniques, instead of just one, making it more of a sure bet that one will work great for you and your shop. 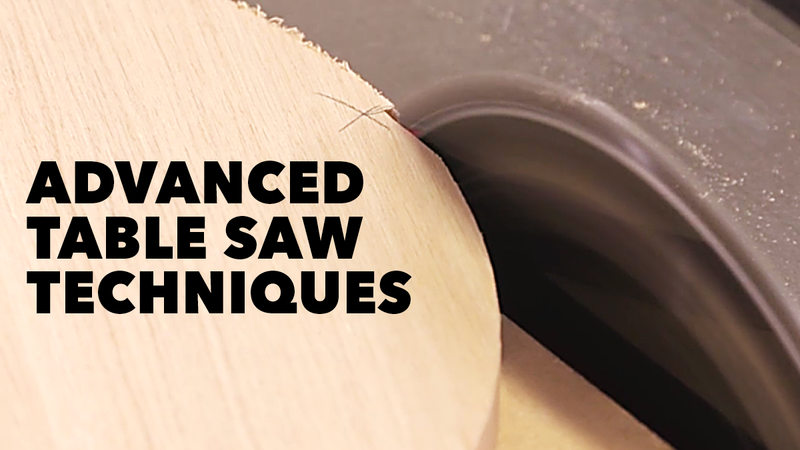 While it’s true that a table saw excels at ripping, crosscutting and dadoes, there’s SO much more you can do on your saw. Buckle your seat belt and get ready to learn! You’re going to be amazed by the seven incredible techniques you’ll learn in this video class. Use your table saw as a pattern cutter to make identical parts. Cut extremely steep angles. This is a must-have skill for flag cases. Make raised panels. No specialized panel raising router bit required. 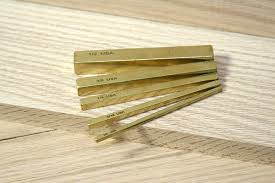 Safely cut tapered legs and build the jig for handling them. Safely rip very thin strips. Long or short pieces, our jigs have you covered. Cut coves. This requires feeding material across the blade at an angle. Cut circles. Yes, you can cut circles on the table saw using a simple jig. 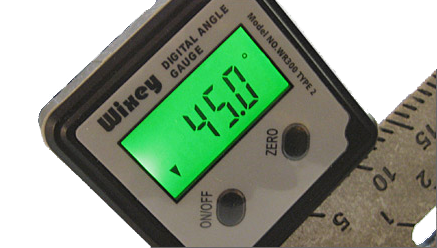 The Wixey Digital Angle Gauge accurately sets saw blade bevel angle. It has 0.1 degree resolution, uses a single AAA battery, and works great for miter saws, table saws and other machinery set up. There are also strong magnets hidden inside the bottom of the gauge securely attach the digital angle gauge to saw blades. Quickly and easily make accurate set-ups with this very helpful tool! 5 piece set comes with 1/8”, 3/16”, 1/4″, 3/8” and 1/2” stackable squares which allows for a wider range of sizes. A great way to make exact depth movements on plunge routers. On table routers, they’re perfect for setting distances from the fence to the cutter, or for checking the bit height above the table. Recommended by George.